Time, the ever baffling one directional mystery. A lot of it has been spent between the members of slub on ways to synchronise multiple machines to share a simple beat, sometimes attempting industrial strength solutions but somehow the longest standing approach we always come back to for our various ad-hoc software remains to be a single osc message. This is the kind of thing that seems to normally involve stressed pre-performance hacking, so after having to rewriting it for temporal recursion I thought I should get it down here for future reference! The message is called “/sync” and contains two floating point values, the first the number of beats in a “bar” (which is legacy, we don’t use this now) and then the current beats per minute. The time the message is sent is considered to be the start of the beat. A sync message comes into my system via a daemon called syncup. All this really does is attach a timestamp to the sync message recording what the local time on my machine was when it arrived, and sends it on to fluxus. Shared timestamps would be better, but don’t make any sense without a shared clock, and they seem fragile to our demands. The daemon polls on a fairly tight loop (100ms) and the resulting timestamp seems accurate enough for our ears (fluxus runs on the frame refresh rate which is too variable for this job). From the sync time (in the past, on the left) and the bpm we can calculate the beat times into the future. 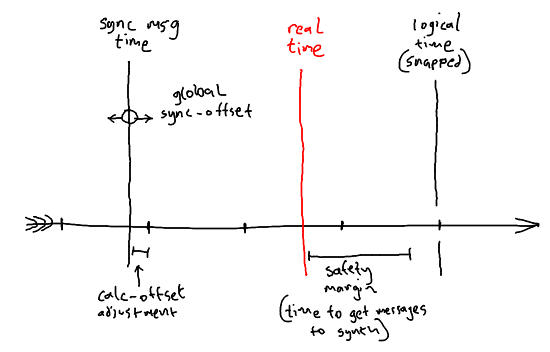 We have a “logical time” which is initialised with the current time from the system clock, a safety margin added, and then gets “snapped” to the nearest beat. The safety margin is needed as the synth graph build and play messages coming from fluxus need to be early enough to get scheduled by fluxa’s synth engine to play with sample accuracy. The last thing that is needed is a global sync offset, which I add at the start of the process, to the incoming message timestamps – this has to be tuned by ear, and accounts for the fact that the latency between the synth playing a note and the speakers moving air seems to vary between machines dependent on many uncertain factors – sound card parameters, battery vs ac power, sound system setup, colour of your backdrop etc. Other than this we tend to keep the networking tech to a minimum and use our ears and scribbled drawn scores (sometimes made from stones) to share any other musical data.